Above is one of the most famous star groups in the night skies, the Pleiades Star Cluster also known as M45 or the Seven Sisters. Copyright © 2009 by Richard Yandrick. "God created the Universe around us . . . I'm just documenting the event"
Welcome to A Universe in Time's Site of the Month. June and July's offering is in the category of CCD Astrophotogrphy and Imaging and this month's site owner is no stranger to either. His name is Richard Yandrick and on August 30, 2005 he achieved some unexpected fame. On that day, he found out that his submitted image of only two days prior was posted on one of astronomy's busiest website ever created: The Astromony Picture of the Day, or simply APOD. Seen above is the binary stars Albireo A & B, considered by most stargazers as astronomy's most beautiful pair. Image © 2005 by Richard Yandrick. Bruce McClure said, "Once you master Cygnus or the Northern Cross, you can always find the backbone of the Milky Way Galaxy" and from the looks of our next image Richard has mastered this in a very subtle manner  in Black & White. 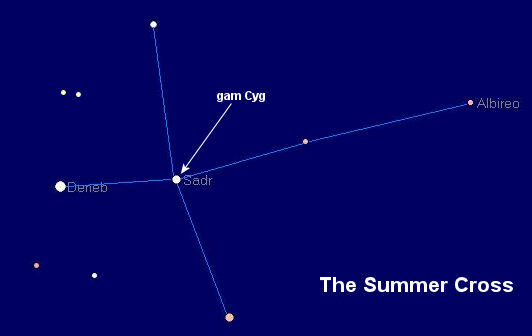 "Here's a single star - Gamma Cygni the middle star in the 'Summer Cross'. It's a monochrome image (Didn't get time for color), but so spooky in appearance - a lone local star in a field of nebulosity and dimmer/more distant stars." Seen above is the variable star Gamma Cygni, known also as SADR, gam Cyg or 37 Cyg. The star can be located at RA: 20 22 13.7019 Dec: +40 15 24.045 and has a listed spectral type of F8Iab. Image © 2009 Richard Yandrick. 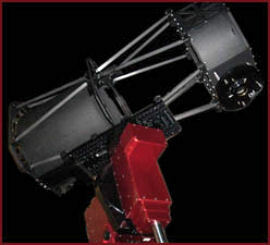 "At present, CCD imaging is being done with a carbon fiber truss, 12-1/2" f/4 corrected Newtonian telescope I completed building in 2008. It was quite a challenge, and involved a bit of custom design and fabrication of truss plates, truss components, etc. The results have been an extremely stable focus and a vert rigid OTA structure. 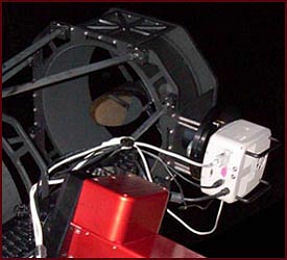 On this scope, the imaging train is a 3" Keller corrector, PDF focuser, and Sbig STL11000 camera with AstroDon L,R,G,B, and Ha filters installed. The primary mirror is a 12-1/2" f/5 from R.F. Royce and a 5" secondary mirror from Ostahowski Optics. This all sits atop a Paramount ME, utilizing a variety of software for control and acquisition including TheSky6/Tpoint, MaximDL, FocusMax, AAG Tpoint Mapper, PinPoint Astrometric engine, and CCDautopilot." Richard obviously knows what he is talking about as the images in our next section well illustrate. For a more thorough review of Richard's equipment click here. 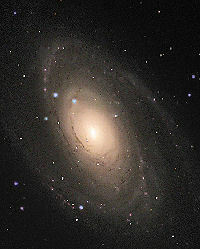 "M81 is a beautiful spiral galaxy in the constellation Ursa Major (Big Bear), or the Big Dipper, at a distance of 12 million light years. 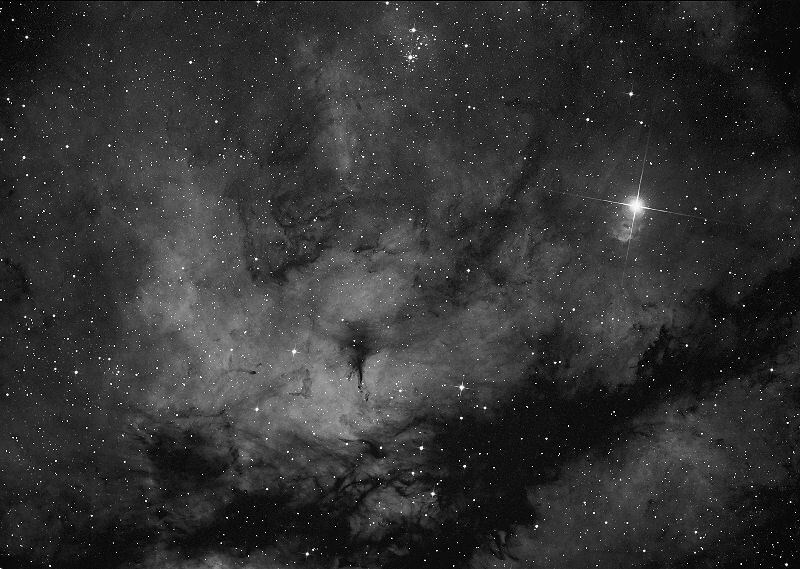 This image was obtained by combining 70 minutes of Luminance and 5 minutes each of R,G,B binned 2x2 with a 10" f/5 corrected Newtonian / Sbig ST2000 camera." You can view Richard's larger image by clicking here. Image © 2005 Richard Yandrick. As for our site of the month astrophotographer, Richard Yandrick's vocation is a little closer to the profession; he works as a principal for an engineering and surveying firm, but that just makes the math a little eaiser. Building your own system in order to find an object located in an area 13 billion light years or so big in order to photograph it with perfect clarity is another subject of art, skill and dedication. Not only that, but consider what it has taken science decades of research, billions of dollars, thousands of professional PhD's and a world of accredited institutions of science to achieve, then you can all the more appreciate the results that Richard, and others like him, have achieved for less than thirty-thousand dollars and three hours of pure enjoyment; ok, and some hard work too! 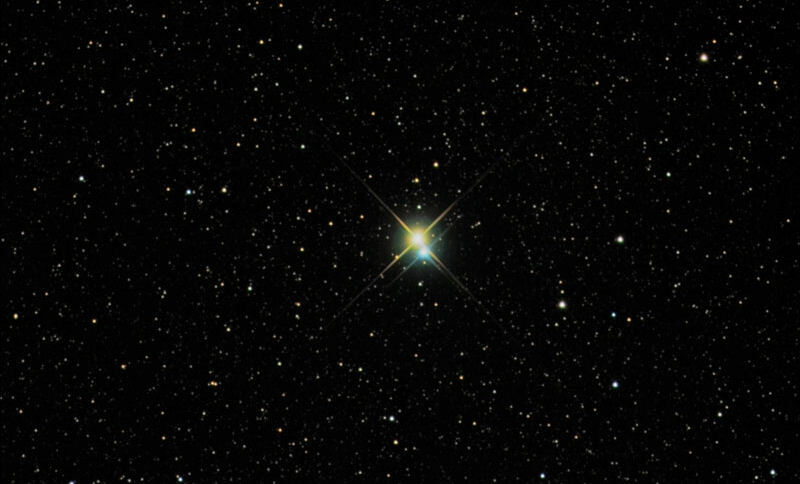 Put in another way, Richard's been eight years in the hobby of CCD astrophotography and what he has accomplished is remarkable indeed, including his famous 380 light-years distance photo of Albireo A & B ( above ). Q: Do you teach, demostrate or give advice on the internet or at public functions regarding your hobby (club functions, astronomical societies etc)? A: I have in the past, in a few different venues. Q: How long have you been pursuing ccd astrophotography? Q: Do you have any formal training or education? Are you self-educated? Q: What has been your astronomical work since the publication of your image of Albireo A & B at the Astronomy Picture of the Day website? A: Still pursuing more imaging, and responding to many (40+) universities, publications, museums, etc. that use the image [Albiero A & B]. Q: What is your hands-down favorite stellar object? Q: Is the equipment layout on your website still the current set of tools you employ? A: For the most part, it's still the same arrangement. I did rebuild the secondary to house a 5" secondary now, and machined a new set of stainless double seconday vane arrangement. This new assembly keeps the heavy secondary mirror stable through all orientations in the sky. Q: What is in the future for Richard Yandrick, astronomically speaking? A: Continue to image, hone my imaging skills, utilize more in depth functions of software, with this years goal being to work with my Paramount and scope setup to approach the ability to image unguided for 10 minutes. Unless otherwise stated, all images are the sole copyright © property of Richard Yandrick and may not be reproduced or copied in any manner from herein without prior written permission of the owner, Richard Yandrick. The images used on the above page(s) are for the sole purpose of information and display at A Universe in Time website and have been used with the kind permission of Richard Yandrick. Page Designed by Ken Pinkela 2009 -- .css Template Modified for use by Doreen "brite_star" L.